At last! A Fellowship after my own heart! I'm Amy Pawlak's husband, and the blogmeister of a hit-and-miss effort called Improvised, in which I write about whatever I want, whenever I want. Very amateurish, if you ask me. Thanks, and God bless you all! You mean there's no one in here trying to warp our little minds by getting us to fight over things we shouldn't even talk about? No one trying to sell us books (thereby making a fortune off Ma Church)? WHAT?? WHAT?? This *is* the B-Team. I love it. Here is one of the great things about AC, I just found your prayer blog when I would not likely have otherwise. Thanks B-Team and thanks Dave and Amy. 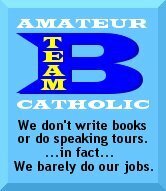 Anonymous, I'm pretty sure none of the non-amateur Catholics are "making a fortune off Ma Church." (Plus, we need some controversy up in here if this is to be a true group blog).